Unlike many of his contemporaries and forbears in the classical music world, Benjamin Britten loved writing pieces for children and amateur performers. Saint Nicolas and A Ceremony of Carols beautifully represent this area of the composer’s interest. That a polished new recording of these works from the Hyperion label emphasizes adult and highly-trained performers over the ones championed by the composer impacts how we experience this music. While adults continue to perform the work regularly (it has been arranged for SATB chorus by Julius Harrison) younger voices imbue it with an irresistible lightness. Accompanied by Sally Pryce’s limpid-sparkling harp playing, the women of The Choir of Trinity College Cambridge sing with warmth and passion. But the heavier, vibrato-laced quality of the mature female voices fills out the filigree texture of Britten’s music. Saint Nicolas also makes use of children’s voices – alongside a mixed adult chorus, a chamber orchestra and a tenor soloist. The work, which dramatically recounts legends from the titular holy man’s life, was commissioned in 1948 for a school’s centennial celebration and Britten scored it specifically for the resources on hand. As such, only the tenor soloist and lead instrumentalists require a high level of expertise. 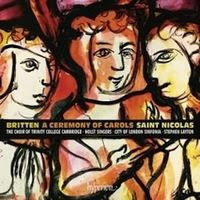 The ultra professionalism of the forces involved in this recording’s version of Saint Nicolas — which also include the Holst Singers, the City of London Sinfonia, the Boys of the Temple Church Choir, tenor Allan Clayton and conductor Stephen Layton — captures the work’s harmonic and melodic ingenuity and narrative power. That being said, in our increasingly fractured, specialized world, cultural events that bring performers of diverse capabilities together can play a crucial role in forging human connections. With catchy tunes that render it easy and fun for amateur singers to digest, and shifting tonalities and chromaticisms that provide plenty for professionals to chew on, Saint Nicolas represents “community music making” in its highest form. The “all-pro” recording is sonically vibrant even if it lacks this compelling ideological core. I sang in a serious boy choir in the 60s, and I sang the Balulalow solo. My clearest memories of the choir are singing the Cermony of Carols. These days, I'm singing classic pop jazz song with ukulele and Hawaiian steel guitar.